This year’s SXSW Interactive put attendees through a gauntlet of wind and rain, endless lines, plus Austin’s cab-dispatching system being down for days. It wasn’t all bad, though: There were free tacos and beers galore, and the sun finally did come out. But inconveniences are exactly what just-in-time task and errand services like Zaarly and TaskRabbit thrive on. We asked them to send us their best and their weirdest requests from SXSW. Though these prices can be negotiated and not every request is filled, Zaarly said its average request price was $95 and its median request price was $20, while TaskRabbit said its average price was $45. Perhaps the largest demand of the weekend was transportation. Though SXSW provides shuttles between its sprawling session locations, and there are also city buses and a good showing of pedicabs, and even a traveling karaoke lounge on an RV, Austin’s major taxi-dispatching system was down, so calling for an official taxicab was a joke. 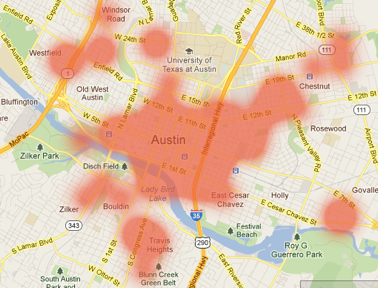 Zaarly said it saw huge demand for impromptu rides, sending the heat map above of where the requests came from (which is not super informative, but it’s a nice visual of downtown Austin being blanketed in angry red demands). Meanwhile, Uber CEO Travis Kalanick told us that on Monday his company had a fifth as many trips in Austin as in San Francisco, Uber’s first and largest city. Getaround said it helped people with as many as 100 car rentals after launching just last week. -Lauren Goode contributed to this article.